England and Sussex left-arm spinner Holly Colvin is taking a break from cricket with immediate effect to pursue a career outside the game. 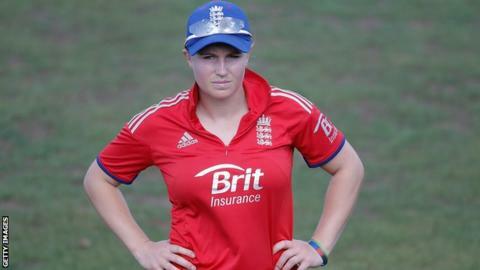 The 24-year-old, a four-time Women's Ashes winner, will not be available for the Ashes in Australia in the new year. "After eight years in the sport I feel now is the right moment to take a break and seek to establish myself in a career outside cricket," said Colvin. Warwickshire's Rebecca Grundy takes her place in the England performance squad. Uncapped Grundy, 23, is also a left-arm spinner. Colvin, the Sussex captain, made her England debut at the age of 15 in an Ashes Test against Australia at Hove in August 2005, becoming England's youngest Test cricketer of either gender and taking 3-67 in the first innings. "This is not a decision I have taken lightly as playing for England means so much to me and has been an integral part of my life since I was 15 years old," added Colvin. "The England team management fully understand my thinking and I have reassured them that I have no intention of retiring from the sport. "There is still much that I want to achieve in international cricket and I very much hope that I can be part of a successful England team again in the future." Colvin was a member of England's World Twenty20, World Cup and Ashes-winning sides in 2009 and helped them regain the new multi-format Ashes earlier this year. Having studied at Durham University, she also spent a fortnight coaching children in Kenya in 2012 with the Cricket Without Boundaries charity. The England and Wales Cricket Board's head of women's cricket Clare Connor, who captained Colvin in that 2005 Test, praised the spinner's contribution to the sport. "She has been a key member of the team, playing her part in our World Cup and World T20 wins in 2009 as well as successful Ashes campaigns in 2009 and 2013," said Connor. "I am sure that many exciting opportunities will open up for Holly and we wish her every success as she takes some time away from the game to explore new avenues."